We have been meaning to post this for a week or two now and have just got around around to taking some pictures. We are massive fans of the work of street artist Swoon and don't know why we haven't come across this publication before this. 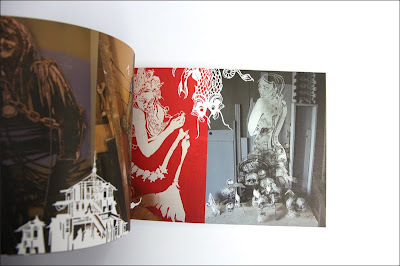 While not exactly new, the book was published in October 2008 by Deitch Projects to accompany Swoon's "Swimming Cities of Switchback Sea" fall 2008 exhibition at Deitch's Long Island City project space. We have only just stumbled upon it recently on Amazon. Featuring over 64 pages, this first monograph documents the artists exhibitions from 2005 to 2007 including her 2005 show at Deitch and 11 Spring Street, as well as collaborations created in Russia, Ukraine and throughout the United States. While the main focus of the photography in the book is Swoon's gallery work, it does feature a small section of street work including some of Swoons very early street work before she began creating the beautifully elaborate cut-out pieces that we now know her for. 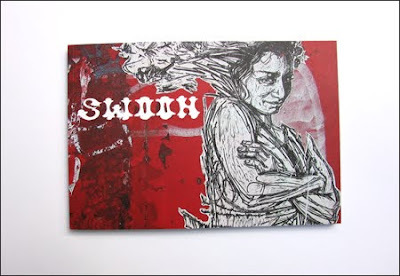 Also in the book is a short eassy written by Swoon about how and why she started to work on the streets. 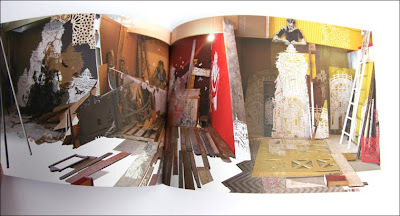 This book is a great addition to any bookshelf and essential if you are a Swoon / Street Art fan. Yeah it's a great book and I stumbled upon it one day just like you did. The photo quality could be a bit better though don't you think?